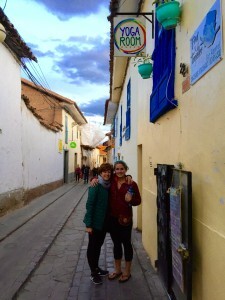 While traveling in Cusco, Peru, my daughter Julianna and I walked together up a hill on a narrow cobblestone road. We ducked our heads to enter a small, empty room, and then we made our way up a spiral staircase to the Yoga Room. But Ashley didn’t stop there. She asked us to repeat our intention three times perhaps another four or five times before class ended. I had never heard these instructions before. Repeat three times. Repeat three times. At first I resisted. But by the third time, I was smiling. Ashley made me really set my intention. She made me commit—to something, anything! There was no skipping out. You see, it’s easy to set a weak intention. It’s easy to fake it. I do it all the time, and I am sure that most of my students do as well (c’mon fess up!). I use the same intention all the time: Remain awake. After repeating my intention several times, I found myself reflecting on if I am really willing to commit to it. Repeating my intention over and over again made me made me pause and ponder. If I am going to repeat something that often, then it better be good. It must be meaningful. Remain awake. Remain awake. Remain awake. Repeating this intention throughout my practice brought these words to life. As I ducked my head, left the Yoga Room, and followed the narrow road in Cusco, I felt energized and invigorated from the process of repeating my intention. I’ve been practicing repeating my intention ever since. Thank you, Ashley. I invite you to set an intention around a quality you’d like to explore in your life. Repeat your intention three times throughout the day. Why not give it a try? What do you have to lose? I’d love to know what happens.